Well's it time to take stock and ask yourself if your fulfilling your passion, working where you are satisfied. If you thought on this question for more than a minute,It's time for you to join me and change your life. Experience education through the world of Color & Material Design. PNCA - MLab is a wonderful opportunity for you to educate yourself creatively. Whew! 12 weeks flew by and we completed our launch of PNCA's first Color Material Design intensive program. Nine unbelievably dedicated CMD's completed teams of Footwear and Apparel designers that influenced Nine Brands this past fall.They researched, ideated, designed, developed, prototyped, sewed and created the most compelling and emotional stories. The CMD's lead through Color & Mood boards and showcased their expertise of Material iD and how they connected this to their consumers. They worked as teams and developed their personal professional branding to prepare them for next steps. I am so proud of each one, and everyone in this maiden PNCA |Pensole x MLab class, but now its time for a new crop of creatives to take that leap of faith, stop waiting for things to happen to you and make things happen for you, because of you! Sign up now to be considered for this amazing journey and become part of the Pensole family. It's here, I am so excited about our partnership with Pacific NorthWest College of Art. I have the opportunity to reach a larger audience while creating an extended Color and Material Design program filled with innovative and critical thinking content as well as guest speakers "we are calling "Fire Starters"-experts from around the globe that will share, inspire and mentor you to get to the next steps of your new path in CMDesign. I encourage you to change your life, invest in your creative soul, make that career change finally! GET READY KICKS KAMP is coming to PORTUGAL, PORTLAND, AND TORONTO! 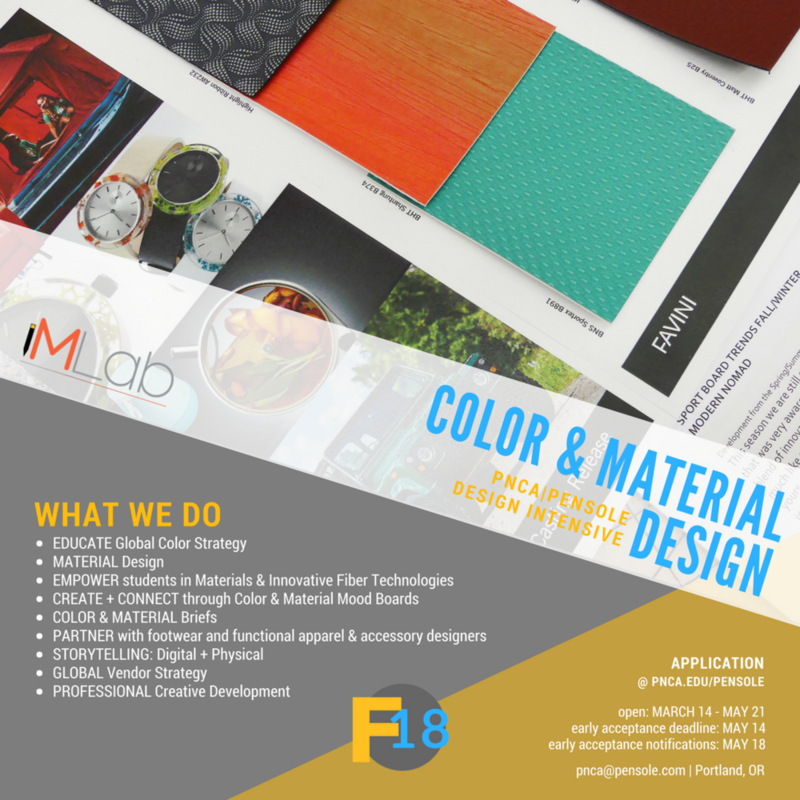 Calling all European & North American Color & Material Designers! This is your chance to elevate your design knowledge and strengthen your role as a Color & Material Designer. The top student from each KICKS KAMP (one from Portugal, Toronto, & Portland), as selected by Suzette Henry, founder of MLab, will receive a scholarship (including free tuition and shared housing) to attend one MLab @ PENSOLE Master Class in Portland, Oregon, USA. This amazing opportunity is valued at $6,800 USD! This calendar represents my teaching Color + Materials + Finishes during Pensole sessions. If you are a creative soul and would like to empower your skills I encourage you to go to the Pensole.com site and find out more. Footlocker will partner with 4 Brands /sponsoring 4 separate sessions/Brands to be revealed later in the year. Professional Development classes in 2016 will be limited to Brands or indivduals who wish to contact me directly to customize due to the intense Pensole calendar. Please contact me at suzette@thehangersandlasts.com for Professional Development class inquiries. storytelling and so much more! Click "Read More" below to see our flyer, and contact us with any questions. To register, send an email to Suzette@Thehangersandlasts.com.